Colleen DeLory is Editor of the Library Connect Newsletter and The Academic Executive Brief. Before joining Elsevier in 2010, she worked in communications positions at the University of California, San Diego and San Diego State University, where she started a faculty/staff news website. Her goal with Library Connect is to provide a forum in which librarians from around the world can share their thinking on broad and systemic issues, as well as practical, hands-on advice based on their own challenges and successes. For this feature, she interviews, Dr. William Gunn, Mendeley’s Head of Academic Outreach. He discusses Mendeley as an academic social network, the librarian’s role in teaching researchers to use Mendeley, and how librarians themselves are using Mendeley to connect with colleagues with similar professional interests. Before Elsevier’s acquisition of Mendeley, the two companies collaborated on a number of fronts. Can you tell us about why there is a good fit between the two companies? If we were on Facebook, we’d have to describe the historical Mendeley-Elsevier relationship as, “It’s complicated.” There was a lot of good collaboration with some groups and then other groups would be telling us, "You can’t put up PDF previews," or things like that. For my part, I was a ringleader in some of the online movements of last year, such as the Cost of Knowledge boycott and the whitehouse.gov public access petition. So we’ve had this history, but we’ve also had a very good history of productive collaboration. For example, when Elsevier shut down 2collab, its scientific social network, the product manager involved, Michael Habib, recommended that everyone move their services over to Mendeley, and we made it easy for them to do that. I also attended the first Beyond the PDF conference, where I met Bradley Allen and Anita de Waard, both of whom were at Elsevier Labs at the time. I realized over the course of interactions like these that Elsevier was interested in exploring some of the same issues around scholarly communication that we were pursuing at Mendeley. Read more about Mendeley in Elsevier Connect. 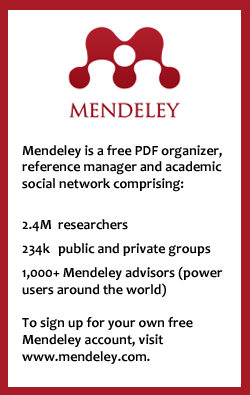 Most librarians are familiar with Mendeley as a tool for organizing PDFs and references; I’d like to hear your thoughts on Mendeley in the research workflow and as an academic social network. The social networking thing is perhaps what I’m most excited about. Social networks get better as the scale of them grows. So when you combine a research network of our scale and the world’s largest science publisher, great things are probably going to happen. Just four years ago, there were doubters about the concept, but it turns out that scientists are people too, and they do use social networks like everyone else. So not only has Mendeley proven to be really useful in terms of individual benefits for organizing PDFs and managing references and making it easier to write papers, but it’s turned into a really important discovery tool for the researchers as well. A lot of interesting discussion happens in the groups. We’ve even found that activity on Mendeley, such as the number of people who have a given document in their Mendeley library, is correlated with how many citations that paper is going to get. And it’s even broader than that, because you can actually see the impact that a given bit of work has not only on the people who are writing papers and citing it, but on a wider audience – the practitioners: nurses, small businesses, the general public, lay scientists. This picture of Mendeley readership in the broader social space has a really important effect on allowing us to build better discovery tools. We can leverage that data and use the collective wisdom of all the world’s scientists to make research more efficient. What kind of interaction do researchers and their contacts have on Mendeley that they wouldn’t have on other social networks like LinkedIn or Facebook? Social networks are a really interesting space because you can pick up data about what’s going on in research. I use Twitter quite a lot because it asks so little of you to read or write to the network. I use Twitter to see what someone is thinking about at the moment, and I use it as the scaffolding on which all of my other interactions hang. When I add papers to my profile, for example, it gets tweeted, and many scientists use it to discuss talks they’re attending. For my first year on Twitter, that’s almost all I used it for. I keep a profile on LinkedIn because if I want to know what someone has done or where they’re working, I’ll go look them up, and so I figure they might do the same for me. I don’t really use Facebook too much, as it’s really to more keep up with your college friends or people from your hometown, and so I don’t see too much research activity going on there. So as I mentioned, I use Twitter as the scaffolding on which other interactions hang, but then when I have those more substantial interactions, they tend to happen somewhere like Mendeley. That is where we can get into detailed discussions about a piece of work, or where you might invite someone to a conference. It’s interesting how our different activities segregate themselves out into the different networks. Your “destinations” seem to be taking you to a wide range of library conferences. Why are librarians such a key audience for Mendeley? I’m really excited that you saw the list of where I’m going on my Mendeley profile! Not enough people use that feature. If more people used it, then we would have more data and we could recommend not only papers or colleagues, but also conferences you might want to attend or places you might want to send your paper. I first became aware that librarians were a key audience for Mendeley at a Coalition for Networked Information meeting around 2009. I was giving my basic presentation about what Mendeley is and someone afterward asked me, “So what sort of metadata schema are you using to store your data?” I thought for a minute and then said that I don’t think we have one. What I have since learned is that the tech community has a metadata schema that’s optimized for high availability and scalability, while the librarian community has a metadata schema that’s optimized for preservation and access and interoperability. So it’s really been neat to take librarians on as advisors and bridge the varying needs. We get a lot of important feedback from the Mendeley for Librarians group (see sidebar below), and they have been very crucial in helping to spread the word about Mendeley. One of the most common bits of feedback that we would get from researchers early on is that they found out about Mendeley later than they would have liked. They would be frustrated that they hadn’t been able to use such a great tool while working on their dissertation, and would literally ask, “Why didn’t anyone tell me about this?” I felt like we were failing librarians because they were the ones getting the blame for us not having done our outreach properly. Yes, the outreach has definitely worked. There are now hundreds of LibGuides on Mendeley and librarians have given thousands of presentations on the tool. They are also using Mendeley for their own professional interests. For example, a bibliometrician, Judit Bar-Ilan, found that we had about 98 percent coverage of the bibliometrics literature in 2012. Biological sciences and medicine has been our biggest demographic, but in terms of the percent coverage of the field, library and information science has been very, very high up there. 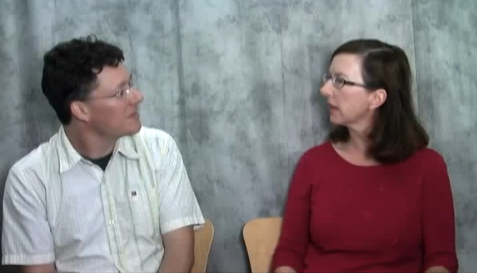 In this series of four short videos, Library Connect Editor Colleen Delory interviews Dr. William Gunn, Head of Academic Outreach for Mendeley. Part 1 — Mendeley and Elsevier Collaboration - "It's complicated." Part 3 — Which Social Tool for the Task at Hand? Trainings, demos, and inspiration from expert users of Elsevier's world class scholarly research and publishing tools.